Containing tasting notes, historical, agricultural and culture information, The Harney & Sons Guide to Tea is a beautiful hardcover book that every serious tea drinker will love to have in their collection. Arranged with a tin of Harney & Sons' 30th Anniversary Black Tea and a lovely 10 ounce porcelain teacup, this gift is perfect for so many different occasions. 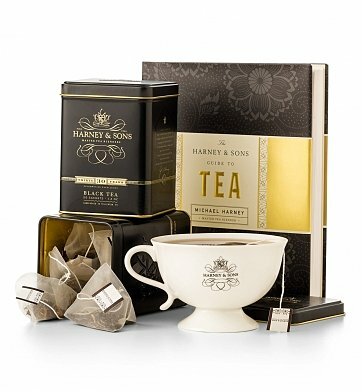 One 30th Anniversary Harney & Sons Black Tea Tin, 20 Sachets. 226-Page Hardcover Book, The Harney & Sons Guide to Tea. 10 Ounce Porcelain China Harney & Sons Teacup. Gift Box Measures 14" x 12" x 6". Michael Harney (son of founder John Harney) has been the tea buyer and blender of Harney & Sons for twenty years. He regularly travels to Asia and meets with tea producers from all major tea countries, scouring the globe for the season's best teas. He graduated from Cornell University and lives with his wife and three sons in Connecticut. The Guide to Tea Gift is a hand delivered gift. These gifts are delivered by one of our local design centers located throughout the United States and Canada. Same day delivery is available for most gifts when ordered before the cutoff time. The cutoff time for The Guide to Tea Gift is in the recipient's time zone. Harney & Sons 30th Anniversary Black Tea TinIn honor of John Harney founding the company 30 years ago, Harney & Sons offers this 30th Anniversary Blend. It is based upon one of John's favorite teas: Ceylon & India, with added Chinese Silver Needles and Yunnan Golden Tips. 20 Sachets. The Harney & Sons Guide to TeaAn illuminating resource for tea drinkers interested in developing and refining their palates as well as their understanding of the complex agricultural, historical and cultural significance of tea, The Harney & Sons Guide to Tea will quickly become a classic reference and staple in the library of every serious tea drinker. 226 Pages, Hardcover, Signed by the author.